Read the FAQ section of AzzyAI web page here on offering support for other servers. but is very hard use manualy, or only on MVPs? (I active full combos) But only use one. i believe what my server are responsible. Maybe may be the end the updates, in the AI,ultimate update 2014. Hi, I need help, when i try to open AzzyAIConfig it requires me to install "version .Net framework: 4.0.30319"
may I know what .Net framework? how to enable dance attack ? i true it but its normal movement attack and not applied i try relogging ..
Hi. I downloaded this AI for my Vanilmirth and I followed the installation instructions properly. When I switch to custom AI my homunculus does make the idle circle walk around my character so I know the AI was installed and read properly. But my homun doesn't attack anything? To note, I haven't changed anything (tactics, etc) in the tabs except for that idle walk sequence just to check if the AI was instaled. By default it is only set to target a few monsters (mostly eggs) which you can fine tune later on to possibly prevent frequent Homunculus death during early levels. I play in bRO official server from Brazil. and here manually i can use blood lust when my dieter cast volcanic ash.. or lava slide..
Is it possible to do something for AzzyAI to do this automatically? Edited by SirKoG, 03 February 2017 - 07:03 PM. You would have to configure a few things with it but you should be able to do it. Bloodlust has a long cooldown though so you may just want to activate it under dire conditions. current download of azzyai does not have a user_AI folder. just a data folder. how do i install it? Sorry to send you here but I could not send a private message. I have found that it is possible to avoid the cooldown of the abilities of the homunculus by casting one skill before finishing casting another. But I do not know how to do it by AI? I'm hoping you could help me, just give me a hint how to do it. I also thank you for the work already done. Your AI is incredible. Edited by vividort, 18 June 2017 - 08:22 PM. Edited by xmegas, 19 June 2017 - 09:24 AM. They are all working properly. They can use melee attack as well as skills with the same settings. Therefore, I tried to add SALAMANDER into Const_.lua. UNKNOWNMER	= 100 -- Not official designation. Returned by internal GetMerType() function when it cant determine the merc type. WILDROSE	= 101 -- These are like this because the GetV(V_MERTYPE,MyID) returns 1 for all monster mercs, as well as lvl 1 archer mercs, so we define our own numbers for these. Does anyone know how to add it properly? Is it possible to have Sera cast pain killer on me every X (<60) seconds instead of just whenever the buff is out? For some reason my homunculus only attack once then move to a different spot. Anyway to get it to finish killing the monster before moving to the next target? 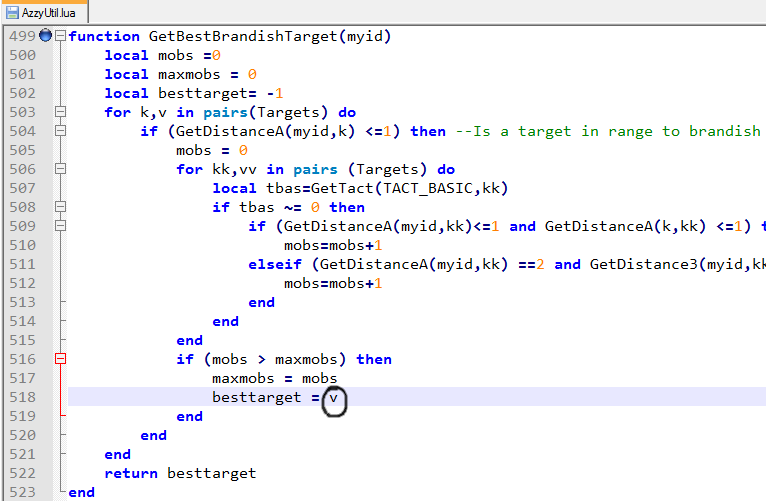 how to use MA_LANDMINE put on same (x,y) in map auto . I use GetBestAoECoord or GetBestAoETarget and AtkSkillList add MA_LANDMINE ?